People with specialized expertise are needed to build the apparatus for these experiments. For example, Fermilab’s Proton Improvement Plan-II, a project to upgrade the lab’s particle accelerator complex to provide protons beams for DUNE, requires individuals with expertise in superconducting radio-frequency technology. “We’re tapping into the SRF expertise around the world to build this,” says Michael Procario, the Director of the Facilities Division in the Office of High Energy Physics within DOE’s Office of Science. For decades, physicists have been searching for dark matter, which doesn’t emit light but appears to make up the vast majority of matter in the universe. Several theoretical particles have been proposed as dark matter candidates, including weakly interacting massive particles—called WIMPs—and axions. Fermilab’s Aaron Chou is leading a multi-institutional consortium to apply the techniques of quantum metrology to the problem of detecting axion dark matter. The project, which brings together scientists at Fermilab, the National Institute of Standards and Technology, the University of Chicago, University of Colorado and Yale University, was recently awarded $2.1 million over two years through the Department of Energy’s Quantum Information Science-Enabled Discovery (QuantISED) program, which seeks to advance science through quantum-based technologies. If the scientists succeed, the discovery could solve several cosmological mysteries at once. Finding an axion would also resolve a discrepancy in particle physics called the strong CP problem. Particles and antiparticles are “symmetrical” to one another: They exhibit mirror-image behavior in terms of electrical charge and other properties. The strong force—one of the four fundamental forces of nature—obeys CP symmetry. But there’s no reason, at least in the Standard Model of physics, why it should. The axion was first proposed to explain why it does. Finding an axion is a delicate endeavor, even compared to other searches for dark matter. An axion’s mass is vanishingly low—somewhere between a millionth and a thousandth of an electronvolt. By comparison, the mass of a WIMP is expected to be between a trillion and quadrillion times more massive—in the range of a billion electronvolts—which means they’re heavy enough that they could occasionally produce a signal by bumping into the nuclei of other atoms. To look for WIMPs, scientists fill detectors with liquid xenon (for example, in the LUX-ZEPLIN dark matter experiment at Sanford Underground Research Facility in South Dakota) or germanium crystals (in the SuperCDMS Soudan experiment in Minnesota [not current, now at SNOLAB a Canadian underground physics laboratory at a depth of 2 km in Vale’s Creighton nickel mine in Sudbury, Ontario]) and look for indications of such a collision. UC Santa Barbara postdoctoral scientist Sally Shaw stands with one of the four large acrylic tanks fabricated for the LZ dark matter experiment’s outer detector. When an axion encounters a strong magnetic field, it should—at least in theory—produce a single microwave-frequency photon, a particle of light. By detecting that photon, scientists should be able to confirm the existence of axions. The Axion Dark Matter eXperiment, ADMX, at the University of Washington and the HAYSTAC experiment at Yale are attempting to do just that. Those experiments use a strong superconducting magnet to convert axions into photons in a microwave cavity. The cavity can be tuned to different resonant frequencies to boost the interaction between the photon field and the axions. A microwave receiver then detects the signal of photons resulting from the interaction. The signal is fed through an amplifier, and scientists look for that amplified signal. “But there is a fundamental quantum limit to how good an amplifier can be,” Bowring says. Photons are ubiquitous, which introduces a high degree of noise that must be filtered from the signal detected in the microwave cavity. And at higher resonant frequencies, the signal-to-noise ratio gets progressively worse. 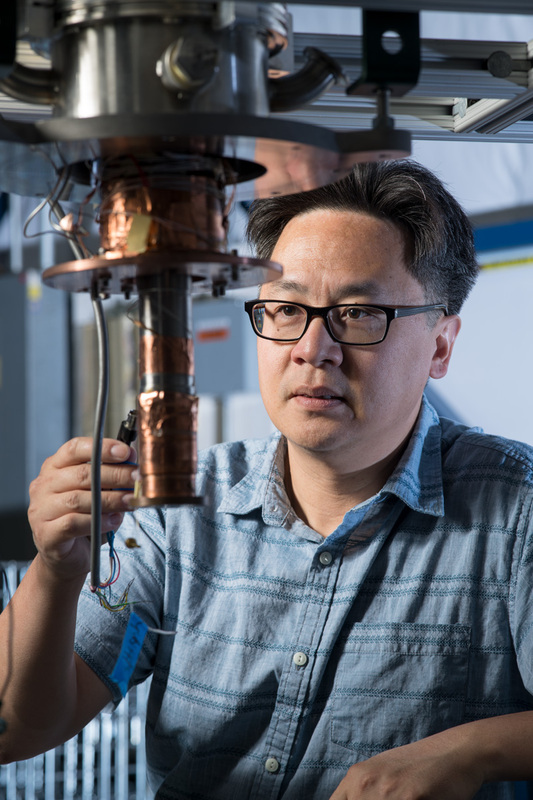 Both Bowring and Chou are exploring how to use technology developed for quantum computing and information processing to get around this problem. Instead of amplifying the signal and sorting it from the noise, they aim to develop new kinds of axion detectors that will count photons very precisely—with qubits. In a quantum computer, information is stored in qubits, or quantum bits. A qubit can be constructed from a single subatomic particle, like an electron or a photon, or from engineered metamaterials such as superconducting artificial atoms. The computer’s design takes advantage of the particles’ two-state quantum systems, such as an electron’s spin (up or down) or a photon’s polarization (vertical or horizontal). And unlike classical computer bits, which have one of only two states (one or zero), qubits can also exist in a quantum superposition, a kind of addition of the particle’s two quantum states. This feature has myriad potential applications in quantum computing that physicists are just starting to explore. In the search for axions, Bowring and Chou are using qubits. For a traditional antenna-based detector to notice a photon produced by an axion, it must absorb the photon, destroying it in the process. A qubit, on the other hand, can interact with the photon many times without annihilating it. Because of this, the qubit-based detector will give the scientists a much higher chance of spotting dark matter. Using a qubit to detect an axion-produced photon brings its own set of challenges to the project. In many quantum computers, qubits are stored in cavities made of superconducting materials. The superconductor has highly reflective walls that effectively trap a photon long enough to perform computations with it. But you can’t use a superconductor around high-powered magnets like the ones used in Bowring and Chou’s experiments. “The superconductor is just ruined by magnets,” Chou says. Currently, they’re using copper as an ersatz reflector. And that means that they don’t stick around long enough to be picked up as a signal. So the researchers are developing another, better photon container. “We’re trying to make a cavity out of very low-loss crystals,” Chou says. Think of a windowpane. As light hits it, some photons will bounce off it, and others will pass through. Place another piece of glass behind the first. Some of the photons that passed through the first will bounce off the second, and others will pass through both pieces of glass. Add a third layer of glass, and a fourth, and so on. Bowring sees the use of quantum computing technology in the search for dark matter as an opportunity to reach across the boundaries that often keep different disciplines apart.